Photo courtesy of Rivier University The Raiders have had a lot to celebrate this season as they are heavy favotires to win the GNAC title and head back to the NCAA tournament. 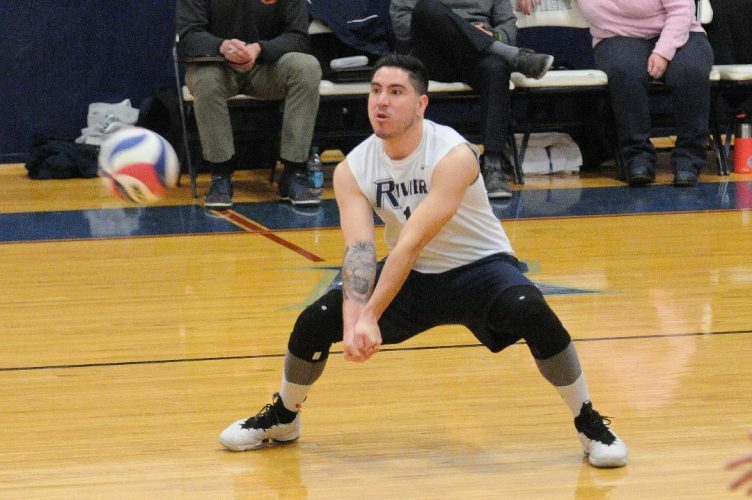 NASHUA – March madness may turn into April gladness if you’re talking about the Rivier University men’s volleyball team. The Raiders certainly are looking like a team that could be NCAA tourney bound in a few weeks. The Raiders have gone 8-1 this month, are 17-7 overall and, more importantly, 8-0 in the Great Northeast Athletic Conference (GNAC). If they keep their conference pace up, the Raiders will almost certainly be able to play their conference tourney games beginning the week of April 8 at home as the top seed and will be the favorites to emerge as GNAC champions with an automatic NCAA Division III tourney berth. 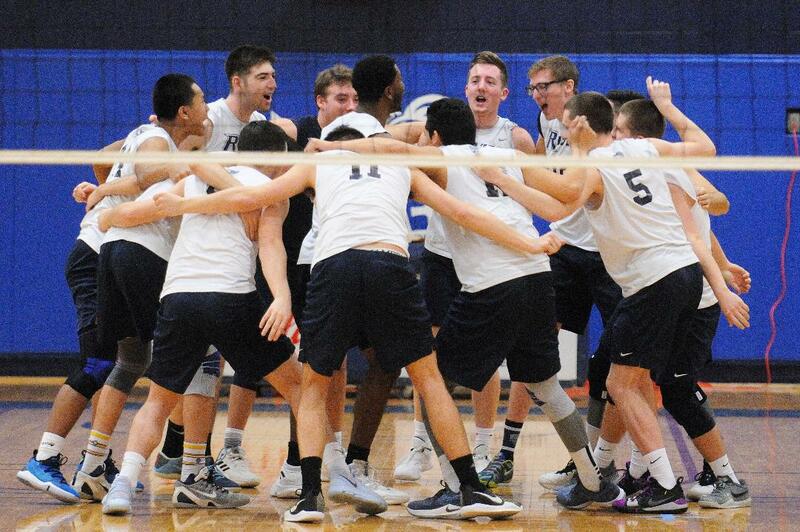 Included in one of those 17 wins for Riv is one over national power Springfield College, on the road no less. Springfield, at the time the No. 1 ranked team in the nation, had beaten Riv 3-1 earlier in the month of February at the Muldoon Center, and the Raiders returned the favor late in the month with a 3-0 win at Springfield. It was Riv’s first win over Springfield since 2014. All that said is that the Raiders are definitely for real. It’s the only Division III loss Springfield has suffered this season, and the first time they’d been swept at home in five years. “We were pretty flawless, but the they realize that’s not going to happen all the time,” Kolek said. Kolek went into the season with hopes, but not expectations, because the Raiders graduated a pair of All-Americans. “But we did have everyone else returning,” he said. As for a hitter, Kolek needed someone to emerge, and someone has. Meet 6-7 junior Fran Kokoros, who was named GNAC Offensive Player of the Week earlier this season. Other keys include 6-3 junior Cam Roth, who moved to the libero spot and was this week’s GNAC Defensive Player of the Week, averaging 4.0 digs per set in two recent wins. The Raiders have won their share of conference awards. Campos has won GNAC offense weekly awards three times, as has 6-3 junior hitter David Smith, most recently just this week with 23 kills in two matches while hitting .556. He leads the Raiders with 229 kills, 2.97 per set. Other key players have been sophomore Eric Roderick out of Salem, and senior Dashaun Graham. “Graham has tons of energy, and when he gets up and gets a block for us, it fires everyone up,” Kolek said. The last team to beat Riv was Cal-Lutheran out at the Cal-Lu-Fornia Invitational in Thousand Oaks, Cal.three weeks ago. The Raiders are at Regis to play both Regis and Johnson&Wales on Saturday. Does think he has an NCAA team? Colby-Sawyer senior Brittany Ireland of Amherst has been named the Great Northeast Athletic Conference (GNAC) Women’s Lacrosse Player of the Week. Ireland led the Chargers with 14 points in a 2-0 week against GNAC opponents. She had eight goals, six assists, six ground balls, six draw controls and three caused turnovers in a recent week’s time, beginning with a game-best seven points (five goals, two assists) in a 17-10 victory over Norwich. The senior then tied for game-high in points with seven on three goals and four assists in her next game while moving into Stseventh on Colby-Sawyer’s career assists list with 42. Saint Joseph’s College of Maine men’s lacrosse team is enjoying the work of two Nashua players. First, sophomore Shane Puleo, a Nashua South alum, was named the Great Northeast Athletic Conference Men’s Lacrosse Player of the Week. Puleo claims the first conference weekly award of his career after netting 10 total points with four goals and six assists in a pair of SJC victories last week. The sophomore attack netted two goals with three helpers in a 13-8 win over New England College on Wednesday and added two scores and three dimes in a 17-9 triumph over reigning GNAC Champion Johnson & Wales University on Saturday. Through eight games this season Puleo leads the conference in points (32) and assists (23) and ranks fifth in man-up goals (four). 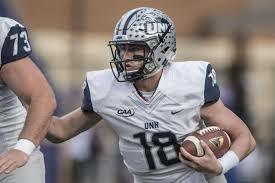 Meanwhile, Puelo’s teammate, Nashua North alum Brendan Martin, has seven goals and four assists, including two key goals in a 17-9 win over GNAC rival Johnson & Wales. Martin’s second goal was on a great individual effort as he scooped up a loose ball 15 feet in front of the JWU goal and bounced a shot – as he was being checked to the ground – just under the crossbar to cut his team’s deficit to 5-4…. Milford’s Bonnie Gillis, a Bishop Guertin alum, was one of 18 members of the Saint Michael’s College field hockey team that qualified for the National Field Hockey Coaches Association (NFHCA) Collegiate Division II National Academic Squad for this past fall.The Purple Knights earned an NFHCA Collegiate National Academic Team Award for the 15th consecutive year. The National Academic Squad recognizes student-athletes that have achieved a minimum cumulative GPA of 3.30 through the first semester of the 2018-19 academic year, while the team award recognizes programs that achieved a minimum 3.0 GPA during the first semester…. Amherst’s Domenic St. Laurent had a season best three goal and an assist for Franklin Pierce in a recent loss to Saint Anselm. He’s a graduate midfielder for the Ravens. Also for the Ravens, Merrimack’s Matt Brewster had a goal in the loss.